NOAA has been testing seafood in the Gulf of Mexico since late April 2010. This photo, taken in the summer of 2010, shows Dr. Lisa Desfosse, Director of NOAA's Southeast Fisheries Science Center Mississippi Laboratories, explaining where and how NOAA samples seafood. NOAA continues to re-test seafood from the Gulf of Mexico to demonstrate to American and worldwide consumers that it is safe to eat, and announced today it will continue this re-testing into the summer. Before waters were opened to fishing, NOAA and FDA extensively tested seafood from those waters, and NOAA has now completed two additional rounds of sampling and testing from each of those reopened areas. Thousands of test results, all publicly available, prove Gulf seafood is safe from oil and dispersant contamination. In June 2010, NOAA, FDA and the Gulf states agreed upon an extensive sampling and testing procedure. Areas once closed to fishing were reopened only when all seafood sampled in the area passed both the established sensory and chemical testing for oil and dispersant. "Gulf seafood is consistently passing FDA's safety tests by a wide margin," said Eric Schwaab, assistant NOAA administrator in charge of NOAA's Fisheries Service. "We are continuing to test, and we are making the data available to the public, so they can make fully informed purchasing decisions." "The system set up to keep tainted seafood out of circulation has worked," said Don Kraemer, acting deputy director for FDA's Center for Food Safety and Applied Nutrition. "Consumers should know that Gulf seafood is extensively tested and is safe to eat." The nearly 500 samples in the two rounds of post-opening testing are comprised of more than 4,300 fish and shrimp, since a sample consists of multiple individuals. They are a representative sample of the commercially and recreationally important fish in the Gulf, and cover the 87,481 square miles of the Gulf that have been reopened to fishing. The specific locations, dates of sampling, species type, and test results are available publicly for each of the samples. "Increased testing, and communicating about the increased testing, is vital for Gulf fishermen and the Gulf economy, and for consumers," said David Krebs, a commercial fisherman and president of the Gulf of Mexico Reef Fish Shareholders Alliance. "It's important to show that our seafood has been proven safe time and time again." Funding for the ongoing testing comes from the Oil Spill Liability Trust Fund, operated by the U.S. Coast Guard, which is available to finance clean-up costs that responsible parties are ultimately required to pay. The government continues to bill responsible parties regularly for the reimbursement of these costs. An area covering 1,041 square miles immediately surrounding the wellhead still remains closed to all commercial and recreational fishing. NOAA will use an FDA-approved plan to begin sampling the closed area on March 12, and will announce the reopening of the area if all the samples pass the established sensory and chemical tests. The first fishing area closure was instituted on May 2, 2010, covering about 3 percent (6,817 square miles) of Gulf waters around the wellhead. As oil continued to spill from the wellhead, the area grew in size, peaking at 37 percent (88,522 square miles) of Gulf waters on June 2. 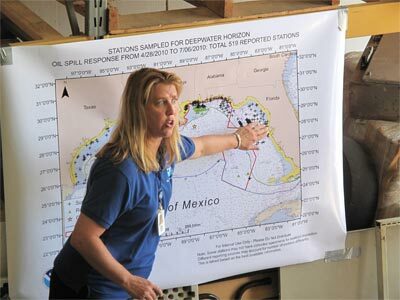 Click here for WFN's coverage of the BP Oil Spill in the Gulf.